The region spanning Andhra Pradesh and Telangana has its own style of cooking, which is marked by tangy and spicy notes. The region is one of the main producers of rice and chillies in South India, and it shows in their food too. Like the rest of South India, Idli, Dosa and Vada are popular breakfast dishes in Andhra Pradesh too. The Telugu people also love Upma. Apart from semolina, they also make Upma with atukulu, as poha is known there. One of their classic tiffin dishes is the Pesarattu, a dosa-like pancake made of green moong and rice. It has a unique texture and rustic taste, which is very satiating and appealing too. In restaurants, they serve a special variant of the Pesarattu, which is stuffed with Upma! Two snacks in one shot, this is very filling and if you are a poor eater, it can be quite difficult to finish by yourself. Puris, millet-based rotis and chapatti are also enjoyed for breakfast as well as dinner. These are served with dry spice powders, chutneys and tangy indigenous sauces. Lunch, like the rest of South India, is a rice-based meal. Rice, topped with dollops of ghee, is served with a range of vegetable curries and dal. When you see the word ‘pappu’ in a dish’s name, you can understand that it comprises dal. It may be plain or combined with veggies. Usually, a meal begins with rice mixed with pappu and enjoyed with a spicy oorgaya (pickle). Other main course dishes are koora (dry or semi-dry subzi), pulusu (sour and tangy gravy made of tamarind, tomatoes, sour curd or raw mangoes), pachadi (a spicy and saucy accompaniment), charu or rasam (a thin, soupy dish that is mixed with rice), curds, and so on. Pulihore, a peppy rice preparation with tamarind and spices, is much-loved by the Telugu folks and everyone who tastes it! Telugu cuisine is generally very spicy. Unlike other cuisines where the pickle is merely an accompaniment, here it is like the highlight of every meal! The Telugu pickle repertoire is like none you’ve seen before. There is a mind-boggling variety of pickles, made with everything from tomatoes to mangoes spiced with mustard, fenugreek and red chillies. The fiery red colour and spicy aroma are quite inviting! To balance the high spice levels, the Telugu people also consume a lot of ghee and curds with their meal. When one speaks of Telugu cuisine, it is impossible to ignore Hyderabadi cuisine, which has a distinct Nawabi touch. It is most famous for Hyderabadi Biryani, which is on the to-do list of most tourists. As a logical extension, the Kormas are equally famous. Although typically non-vegetarian, there are vegetarian versions too, which are popular in most restaurants. Hyderabadi cuisine is also known for its unique, mouth-watering desserts. The desserts are very rich, with a luxuriant feel. Lots of milk products and dry fruits are used in these. Khubani ka Meetha is a special dessert made with apricots and almonds, while Double ka Meetha features a mind-boggling array of ingredients including bread and mava to give a royal experience. Hyderabad is also well-known for special varieties of biscuits like Osmania Biscuit and Karachi Biscuit, and tourists go back loaded with boxes of these for consumption and gifting. Veggies like ivy gourd, bottle gourd, brinjal, tomatoes and raw mangoes are used a lot in Telugu cuisine. Gongura, a leafy plant with a unique sour and tangy flavour is a quintessential Telugu ingredient, used to make tongue-tickling pachadis and vibrant rice preparations. Bottle gourd is used a lot, in both regular cooking and preparation of sweets. Kheers and Halwas made with doodhi surprise the diners with their awesomely icy mouth-feel and fabulous taste! Telugu cuisine also has a vast range of snacks, enjoyed in the evening with a hot and spicy cup of tea. From deep-fried savoury snacks like Bonda and Vada to sweet treats like Rava Ladoo and Boondhi Ladoo, there is choice aplenty. A must-try sweet recipe of Telugu cuisine is the Khaja, a crispy layered sweet made of plain flour, sugar and ghee, often stuffed with dry fruits. Every region of India has its unique culinary fare, and it is really humbling when we realise that it is just impossible to try and discover them all. Every time you think you know enough about a cuisine, you will be surprised by more variety. And our fabulous cuisine also gives lots of room for creativity and experimentation, keeping in line with a region’s general norms, to produce an endless variety of dishes day after day. If you start exploring the culinary treasures of our land, there will never be a single boring day in the kitchen! 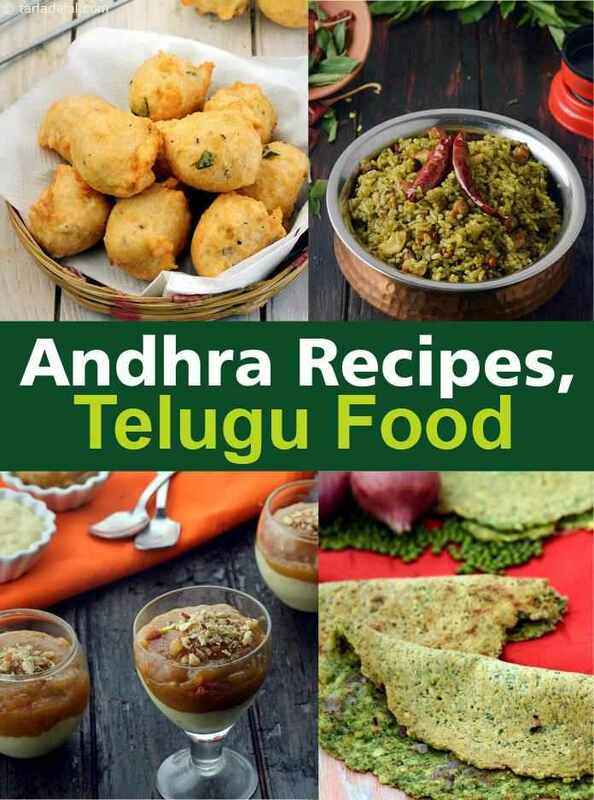 Enjoy our Andhra Recipes and South Indian recipe articles below.